It was only eight years after the death of their Sovereign that the village had once more to go through a period of mourning and to decide how to mark the coronation of King George V. I wrote about those discussions in another article and how the need for a road to the beach had been raised but not adopted. 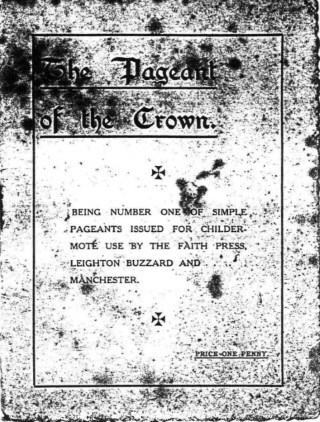 However, on July 22nd 1911, the villagers were entertained by, as the Lynn News reported, "An interesting and very instructive example of pageantry. This entertainment, called The Pageant of the Crown was performed on the natural stage in front of the vicarage on the afternoon and evening of that Saturday. The actors and actresses were children belonging to The Band of Hope. (The Band of Hope had been established in November 1901 and about 100 children were initiated by the vicar.) The Rev, Lewis had directed the production with the help of Mr. H. Walden. and Miss Tombling, Miss Beckett, daughter of Enoch Beckett the post master, and Miss Mann." A full transcription of the report is presented at the end of this article. The pageant opened with the National Anthem, and then two Royal Yeomen came forward with the sacred crown on a cushion which they placed in the middle of the stage and then stood guard. A "Hindoo" Princess (Lena Chaplin) then entered and speaking in verse asks, "Is there some hidden mystery that dwells behind the throne?" Then Mother Church, ably played by Miss Tombling, entered and a Procession advanced singing. The procession was headed by a monk carrying a cross, with bishops, martyrs, prophets and many others. As the procession reached the stage a curtain opened to reveal a heathen altar in front of which sat a Roman Emperor (W, Painter) with a sword across his knees. He declared in flamboyant verse," Mine are the Gods which rule the earth." He faced Mother Church who advanced with the Cross. The Emperor snatched the sword from the altar but fell powerless before the Cross. A Saxon King (J. Valentine) entered with, as the Lynn reporter noted, the battle axe of brute force in his hand. "The strong right arm is the only King that the Sea-Wolf s justice knows." But he too was powerless and fell before the Cross. A Norman King (A. Fitt) entered and attacks the Saxon but peace is restored by Mother Church. Then Edward I (W. Green) Henry V, (A. Mitchell wearing an arched crown with ball and cross on top) Henry VIII (L. Boughen who was presented with a bible) and James I, made their appearance on stage. George III entered carrying a true Union Jack and was crowned. A Bishop led in two negroes in chains. Mother Church declared to George III, "Strike in the Name of England's God and King, Strike off the chains of slavery." So, with the Sword of Justice, George freed the two Negroes from the chains of slavery. The Pageant then retired and every one sang Kipling's "Recessional." Such rousing patriotic scenes must have received a great ovation. The Lynn News commented that the technical difficulties of the costumes were triumphantly overcome. Though they were told that the chain armour was made with string crochet they could hardly believe it. The various crowns and other properties were the vicar's own handiwork and the slave fetters were linked with worsted but not too strong to resist the mighty blow of George's property sword. This was not the end of the entertainment for their followed a series of six tableaux representing historical events. The most popular was the presentation of the first Prince of Wales to the people by Edward I. This was because the infant son of Rev. and Mrs. Lewis made positively his first appearance on the stage of life and smiled at everyone. The Boy Scouts were in attendance to direct visitors through the vicar's beautiful garden and the band of the Sandringham 5th B.N.R. under bandmaster G. Riches played the pageant music and other selections. A profit of £6 was made from these two performances and weather permitting, by popular request the Pageant would be repeated on August 2"d at 7p.m. After the afternoon performance the performers were photographed by Mr. Ralph and then entertained to tea by Mr.& Mrs. Tingay at Manor Farm. It is not hard to imagine the scene as the excited children and adult performers made their way from the vicarage to Manor Farm. Did they have their tea on the lawn in front of the Manor House, or was it laid out in the Tithe Barn perhaps? A copy of the original pamphlet can be downloaded HERE. It must have been a joyful occasion. I have this very poor copy of the photograph taken by the Lynn News but everyone is there in their costumes in front of the vicarage. Does anyone have an original I can copy for the records and display here please? The photograph above was published a week later. An interesting and very instructive example of pageantry in its more religious phase was by the kindness of the vicar and a band of zealous helpers, made available to the parishioners of Dersingham on Saturday. The scheme of "THE PAGEANT OF THE CROWN" is designed to emphasise the fact that the power behind the Crown of England, enabling it to take its leading place in the affairs of the world, is the Christian religion. The central theme is repeated in a series of historical scenes, and any appearance of monotonous repetition is avoided owing to the variety of the tableaux, which follow mainly the course of English history. The pageant opens with the singing of the National Anthem. Then two Royal Yeomen come forward with the Sacred Crown on a cushion which they place on the middle of the stage and stand on guard. To them enters a Hindoo Princess with Attendants: she asks, in the course of graceful verse, "Is there some hidden mystery that dwells behind the throne?" Then at a signal from the Yeomen the trumpet sounds for Mother Church and a procession advances singing, "The Marching Song of Mother Church" (to A and M 219). The procession is headed by a monk carrying a cross, and includes bishops. saints, confessors, virgins, martyrs, prophets and others. As the procession reaches the stage a curtain opens, disclosing a heathen altar in the background. In front a Roman Emperor is seated, with sword across his knees. In flamboyant verse as he places on the altar his sword he declares, "Mine are the Gods which rule the earth, for the rule of the earth is mine". He stands facing Mother Church. Preceded by the cross she advances. He snatches the sword from the altar but falls powerless before the Cross, and she takes the sword from him. Then the heathen altar is changed into a Christian one, and the Roman Emperor kneels at the feet of Mother Church. A Saxon King enters, crowned, with the battle-axe of brute force in his hand, "the strong right arm is the only King that the Sea-Wolf's justice knows". But he also is powerless and falls before the Cross. A Norman King, crowned and carrying mace, enters and attacks the Saxon, but a reconciliation is effected by Mother Church, and the Norman signs the Charter of Liberties. Then we see in succession Edward I, Henry V (wearing arched crown with ball and cross on top), Henry VIII (who is presented with the Bible), James I, and George III, who frees two negroes from the chains of slavery, declaring that "the King shall guard the freedom of mankind". The pageant then retires, the Kings escorting Mother Church, and all singing Kipling's "Recessional". Thus it is demonstrated that "the Gospel service is the Nation's life". From the foregoing epitome some idea may be gained of the scope and pretence of the ceremonial-one cannot properly style it an entertainment-which was presented with excellent judgement and taste on the natural stage in front of the vicarage on Saturday afternoon and evening. 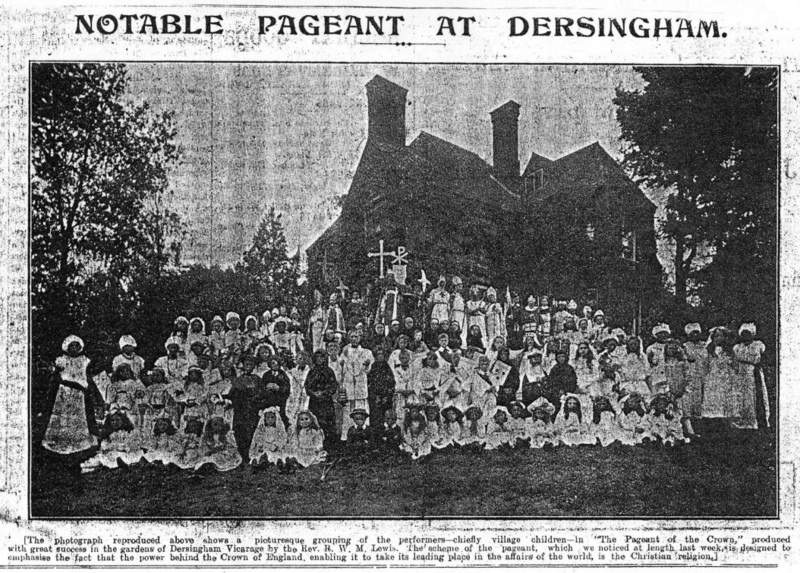 The actors and actresses were children belonging to the Dersingham Band of Hope, and the difficult and complicated work of presentation and rehearsal had been carried out by the vicar (Rev. R.W.M. Lewis), Mr. H. Walden, Miss Tombling (who supported the role of Mother Church), Miss Beckett, Miss Mann and Miss Woodward. Many other ladies and gentlemen rendered valuable assistance in the preparation of dresses and properties. The technical difficulties of costume were tackled with determination and triumphantly overcome; amid a host of sartorial details there was not a suggestion of incongruity, and though we were candidly told that the chain armour was made with string-crochet, we could hardly believe it! The various crowns and kindred properties were the vicar's own handiwork. An infinite number of symbolical details familiar to students of church and secular history-from pictured wheels and grid-irons, to slave fetters linked with worsted not too strong to resist the mighty blow of the third George's property sword were faithfully included in this really wonderful home-made production. 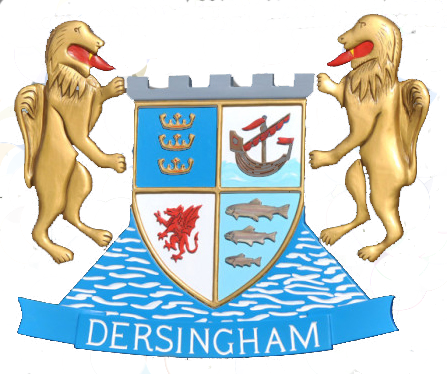 Nothing of Wellington-street, mind you; all made in Dersingham. After the Pageant a series of six tableaux were presented. The first showed Mother Church giving her blessing to the Kings and Bishops. The second-very timely in view of the most recent event in Caernarvon Castle-was the presentation of the first Prince of Wales to the people by Edward I. In this tableaux, the most popular of all, the infant son of Mr. and Mrs. Lewis made "positively his first appearance" on the stage of life, and smiled upon the parishioners. Other tableaux showed "The Conversion of the Saxon King and his wife", "The Martyrdom of Beckett" and the famous scene where the princeling prematurely tries on the crown. In this the attitude of the sick king was probably adapted from the popular canvas "Speak, Speak!" Among those	who	took speaking parts	were: Miss Tomblimg (Mother Church), W. Painter (roman Emperor), J. Valentine (Saxon King), A. Fitt (Norman King), W. Green (Edward I), A. Mitchell (Henry V), L. Boughen (Henry VIII), C. Whitmore (George III) Tom Kerrison and W. Fitt (Yeomen of the Guard), Lena Chaplin (Hindoo Princess), C. Linford and L. Fulcher (Archbishops). The Boy Scouts were in attendance, directing "tenderfeet" through the mazes of the vicar's beautiful garden, and the band of the Sandringham Company. 5th B.N.R., under Bandmaster G. Riches played the pageant music and incidental selections. There was about £6 profit on the two performances. By request the Pageant will be repeated, weather permitting, on Wednesday August 2, at 7p.m. After the afternoon performance on Saturday the performers were photographed by Mr. Ralph, and then hospitably entertained to tea by Mr. and Mrs. Tingey.